Dr. Meow’s Big Emergency is the first in a series of books which all take place in the friendly Whoops-a-Daisy World. In this exciting adventure, Tom Cat has hurt his leg, and Doctor Meow must help him right away. Doctor Meow and her helpers are good neighbors, and good friends, too! Sam Lloyd’s humorous, brightly colored art is thoroughly kid-friendly, and will appeal to fans of Richard Scarry. Each book will feature a different character, but all of the characters reappear throughout the series, so kids can return to their favorite friends in various books. Stay tuned for the second installment from Whoops-a-Daisy World, Chief Rhino to the Rescue! “Doctor De Soto, the dentist, did very good work.” With the aid of his able assistant, Mrs. De Soto, he copes with the toothaches of animals large and small. His expertise is so great that his fortunate patients never feel any pain. Since he’s a mouse, Doctor De Soto refuses to treat “dangerous” animals–that is, animals who have a taste for mice. But one day a fox shows up and begs for relief from the tooth that’s killing him. How can the kindhearted De Sotos turn him away? But how can they make sure that the fox doesn’t give in to his baser instincts once his tooth is fixed? Those clever De Sotos will find a way. 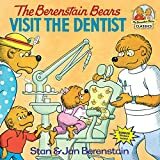 Complete with a visit from the Tooth Fairy, this classic Berenstain Bears story is the perfect way to calm children’s nerves about going to the dentist! Come for a visit in Bear Country with this classic First Time Book® from Stan and Jan Berenstain. Join Mama, Papa, Brother, and Sister for a trip to the dentist where they’ll get checked for cavities, have their teeth cleaned, and learn all about the tools a dentist uses to help keep teeth healthy. Includes over 50 bonus stickers!